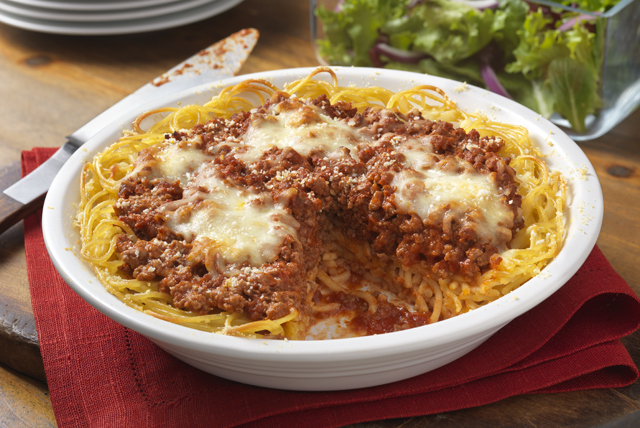 If you've never tried making a spaghetti pie before, this is the one to make! Easy, cheesy, meaty—and all but guaranteed to be a family favorite. Toss spaghetti with half the Parmesan and egg; press onto bottom and up side of 9-inch pie plate to form crust. Mix meat and tomato sauce; spoon into crust. Top with mozzarella and remaining Parmesan. Bake 30 min. or until heated through. Let stand 5 min. before cutting to serve. Serve with a crisp mixed green salad and whole wheat roll to round out the meal.